Customer Name: The name of the customer who booked the event. Guest Names: The name(s) of attendees coming to the event. Time Slot Notes: Any notes you have added to the event. 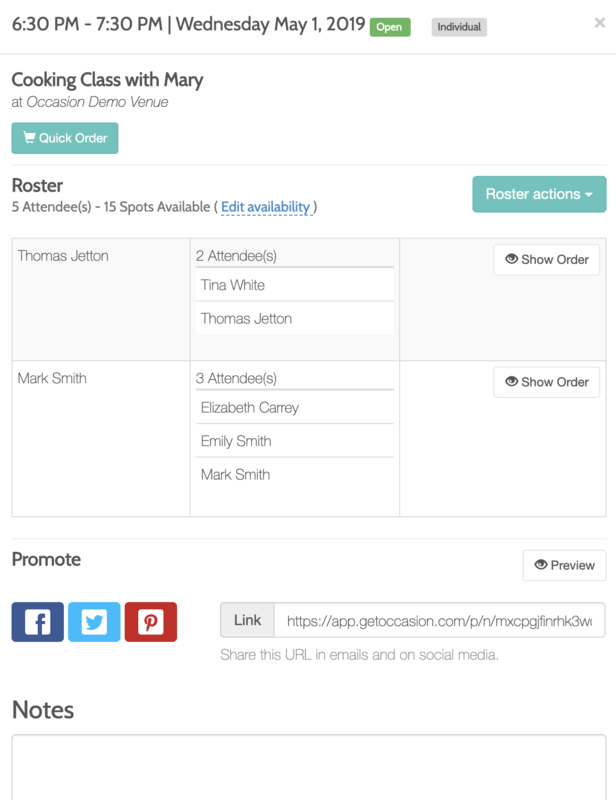 You can trigger a manual email to the roster of an event prior to or after the event. This is great for sending a manual reminder email or for manually collecting post-event feedback. From the "Calendars" page of your account click on the event that you'd like to see the roster for. You will see a list of all registered attendees in the "Roster" section of the pop-up window. To send them an email, click on the "Roster Actions" button and select "Email attendees" from the drop-down. Select the recipients of your email, enter the subject and body of the email and either send it immediately or schedule it for later delivery. Click on the "Roster Actions" button and select "Print roster" from the drop-down. Give it a few seconds and your roster will be ready for printing. Click on the "Roster Actions" button and select "View complete report" from the drop-down. This will take you to the "Orders" page for the event where you can further customize your report. When activated, this feature will trigger an automatic email digest to you every morning at 9am with a roster of all events for that day. Roster is only emailed for events that are public, have availability set to more than one, and when at least one person is registered for the event. This feature is currently in beta and can be requested by emailing us at help@getOccasion.com.